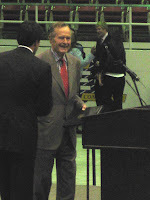 Last night I convinced Drew to bring me to the lectern where President George HW Bush was speaking. It was a free event, and so we kind of just made it a date. For an 84 year old man, President Bush sure does have a great sense of humor! We had a blast... I wish I could figure out how to get the blogger video upload to work-- I got a video clip on the President doing an impersonation of Ross Perot... HILARIOUS! So now I've seen the 40th president in person (LSU graduation back when I was a little kid) & the 41st president. I am hoping that I will get to see George W in person sometime as well. Here's a video of President Bush answering a question about if he thinks that in 2012 we will be divided into 3 parties (based off of comments made by former speaker of the house Newt Gingrich). About mid-video President Bush impersonates Ross Perot. Love it!